I don’t pretend and can’t be an expert on all things US metal, but recently, by way of promotional material coming across my desk, I have been discovering a steady stream of bands having been kicking it around for a while. Lance King, of Nightmare Records, is obviously a lot more in the know on these collectives, and he keeps signing them up to his relatively young label. Enter Order of Nine, active for a decade, three full-length albums under their belt prior to Seventh Year of the Broken Mirror, and I haven’t heard a word about them. I suspect many are in my shoes. Pennsylvania roots and guitarist Steve Pollick playing in Icarus Witch might have connected me to Order of Nine, but as it is Seventh Year of the Broken Mirror is my first introduction to the band. To say the band plays straightforward metal would be quite inaccurate, as the Pennsylvanians combine quite a few traits in their art. If anything, they are a little bit of a “less” band. They are not quite as dark and rocking as Evergrey, not as riff oriented as Iced Earth, not as symphonic as Kamelot and not as powerful as Jag Panzer. Yet, they bring forward their own progressive version of dark, moody, flowing, grumbling and periodically shredding metal, coupled with unusual vocals and technical, full of flair solos. Michael Degrena vocals bring a completely unexpected angle to Order of Nine sound, for better or worse. I do not get comparisons to Queensryche at all, but Michael’s non-straining, almost matter-of-factly, a bit nasal, voice provides for a withdrawn, morose feeling to the music. Whether the band wanted to achieve that or not, such introverted attitude towards vocal delivery adds further gothic angle to Seventh Year of the Broken Mirror, so Type O Negative similarity is positively there. The band, true to themselves in not following just one style, are definitely not as gothic as defunct New Yorkers. Some cuts on the album like Third Wish or Twelfth Talisman either try too hard to be thrashy, before succumbing to stretchy darkness, or simply chug and mope along in a bit non-exciting fashion. Yet there are enough tracks (the opener title cut, Spiral Staircase, Changing of the Guard, Reign Down) where the recipe works, and rhythmically involved riffs and Panzer-like melodies/phrasing stir up the darker, brooding feeling making the album attractive. Keyboards are used very strategically, adding expansive broadly painted strokes to the title track and Dreamspeak. The band can put out something rather epic, Eye of the Enemy has opening folky hook, Iced Earth gallop and moody piano interlude. Order of Nine also has a deep balladeering streak in them, openly enjoying and wallowing in the mire of Innocence or closing crackling, old recorder reverberating closer Winter’s Call. 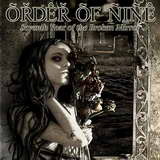 If your passion is uncovering bands similar to the ones unearthed by Shadow Kingdom Records, and you are tired of metal being just a pair of chords and a catchy chorus, Order of Nine has enough depth in their labyrinthine journey to both mesmerize and at times frustrate. The former definitely outweighs the latter, so track this down.